The 2019 Outdoor News Deer & Turkey Classic will continue the state’s grand tradition of showcasing Minnesota’s top white-tailed deer and other big game. The Minnesota Official Measurers again will bring its team of scorers for free scoring of deer and other Minnesota big game. Come to the show and see all the greatest deer Minnesota produced from 2018 as well as incredible bucks from past seasons. Only game taken in Minnesota will be scored. No animals taken in a high fence allowed. Get Your Trophy Scored and Win Some Great Prizes! Be a part of Minnesota white-tailed deer hunting history and include your trophy in the biggest display of state bucks in one place. If you took a mount-worthy buck during one of the 2018 Minnesota hunting seasons, bring it to the 2019 Outdoor News Deer & Turkey Classic. The event allows you to showcase your trophy for the entire weekend, plus, you have a chance to win ribbons and great prizes. Yes, it’s an awesome opportunity to show off the fruits of your 2018 deer-hunting labors. But, even more importantly, getting a rack scored at the Classic could mean big prizes, too, including a Muddy Outdoors Boss XL hang-on treestand. 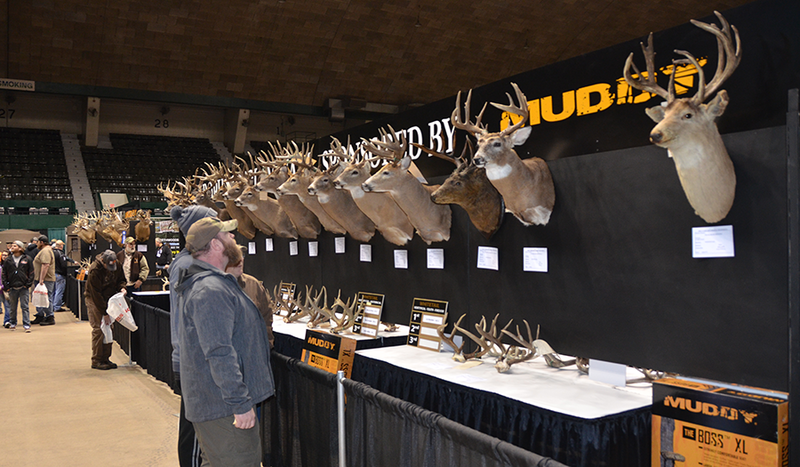 Bring your antlers in for all three days of the show – scheduled Friday through Sunday, March 8-10 at the State Fairgrounds’ Warner Coliseum in St. Paul – and you’ll get a three day pass to enjoy the show all weekend. The Muddy treestands will be awarded for first place in each of the 36 categories, but winners must be on hand for the Deer and Turkey Classic awards presentation on Sunday, March 10 (at 3 p.m.) to receive their stand (winners also receive a blue ribbon). The top three finishers receive ribbons. Those planning to show their trophy antlers this year may bring them to the event on Friday and leave them for the entire weekend. If the owner of a trophy rack intends to display the antlers for the duration of the three-day show, the registration form for the antlers will be stamped, and by paying for a one-day admission, that person will receive three-day admission to the show. Simply pay for a one-day admission ticket on Friday, then if you leave your antlers, you’ll receive a wrist band as a three-day admission. Pick up antlers after 1 p.m. on Sunday. Those intending to bring their big-game trophy antlers to the Deer and Turkey Classic should rest easy in the knowledge that those prized possessions will be in good hands. The State Fairgrounds are policed year-round, and added security is provided by State Fair officials during weekend shows at Warner Coliseum. Outdoor News staff looks forward to seeing you and your antlers at the 2019 Deer and Turkey Classic!